• Preferred Customer Discount Card - Receive 20% off supplemental orders for an entire year with the purchase of a class set! Note: 5-Year Licenses will have Student Books replaced each year. 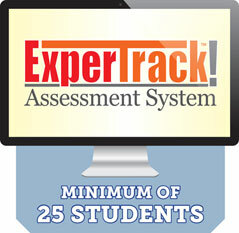 If your class size is greater than 25, after adding this listing to your cart, please contact us at 800.536.2438 Ext. 13 to add additional licenses. Your textbook alternative solution! 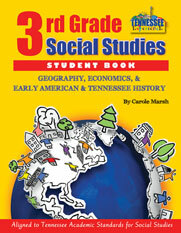 Gallopade integrates all Tennessee social studies standards with textbook content and workbook activities for an all-in-one student curriculum solution. View samples and learn more at TennesseeCurriculum.com. Get online access to tools for every chapter that help you further teach the Tennessee standards! • Leveled Literacy, Writing Prompts, Vocabulary & More! Teacher Edition Workbook & Digital Student Workbook are also included with each set! 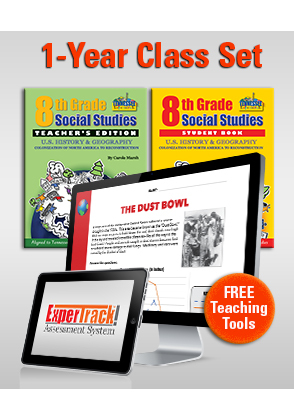 Includes hundreds of auto-graded assessment questions for end-of-lesson and year-end testing. Standard Shipping – 3-8 business days, 10%, $10 minimum. Saver Shipping – 7-10 business days, 6%, $5 minimum. If no shipping method is specified by the customer, standard shipping will be used. All public institutions and/or established accounts with authorized purchase orders may charge their orders, Terms are Net 30 days. Prices are subject to change.